Westweald Falconry respects your privacy. Any personal information you provide to us including and similar to your name, address, telephone number and e-mail address will not be released, sold, or rented to any entities or individuals outside of Westweald Falconry. Credit/debit card information obtained over the telephone or via postal order is kept on file only with customer consent or by customer request. Any credit/debit card information obtained whilst ordering on-line is passed securely through a secure server and all order information is encrypted and made unreadable. 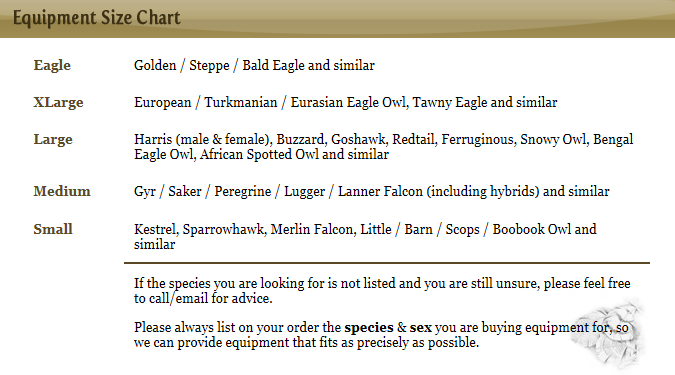 Once the order and payment has been processed, all card information is permenantly encrypted and cannot be viewed by Westweald Falconry thereafter. To verify that you have chosen to add a product to your shopping basket (to help prevent SPAM orders being submitted) - this action is only required once per shopping session. To help prevent SPAM from being submitted by our online contact forms (on our contact us page and the webmaster contact form etc. ), as well as submitting comments on our Guestbook. We use Google Analytics which simply collects data about statistics regarding to how many visitors are viewing our website, how many hits each page throughout the site receives etc. By using our website to use our online store, you agree to allow Cookies from our website. If you are ever asked to accept/allow for Cookies on our website, please accept/allow Cookies whilst using the Westweald Falconry website if you are looking to purchase any falconry equipment/supplies. If you want to find out more about Google Analytics, please visit http://support.google.com/googleanalytics/bin/answer.py?hl=en&answer=55591 . No personal details relating to you are ever stored via Cookies. While we do our best to protect your personal information, we cannot guarantee the security of any information that you transmit to Westweald Falconry and you are solely responsible for maintaining the secrecy of any passwords or other account information. In addition other Internet sites or services that may be accessible through Westweald Falconry have separate data and privacy practices independent of us, and therefore we disclaim any responsibility or liability for their policies or actions. Please contact those vendors and others directly if you have any questions about their privacy policies.